Activists from various states including California, Texas, Louisiana, North Carolina and Utah have already reached out to get involved in the 'Trump Baby' tour. 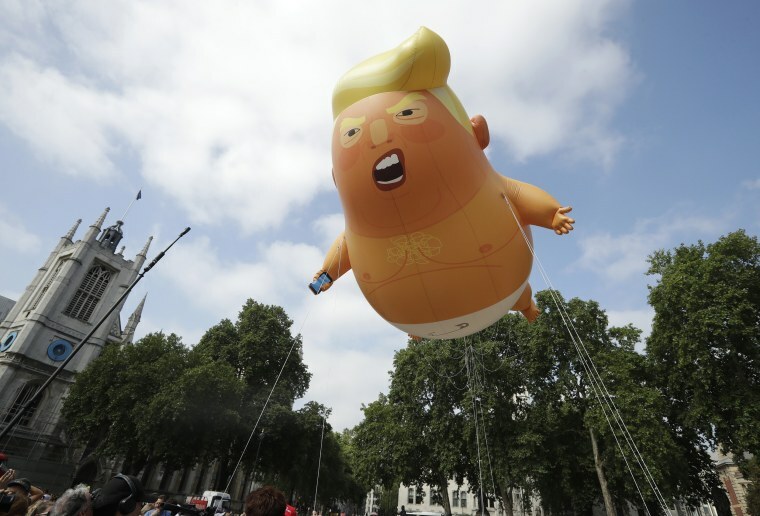 A GoFundMe page to bring the giant blimp of ‘Baby Trump’ — from the recent protests in the U.K. — to the United States has raised more than $10,000 in just three days, doubling its original goal. "This effort is our commitment to opposing Donald Trump in any way we possibly can," activist Jim Girvan, the co-creator of the fundraising page, told NBC News. "This is an opportunity to get even a little bit closer and even more annoying to the president." The "Fund To Bring Baby Trump to America" was a joint collaboration between Girvan and activist Didier Jiménez-Castro. "Didier and I came in contact with one another through grassroots organizations and we put our heads together and had the same idea at the same time," Girvan said. The Garden State natives collaborated after seeing the impact the blimp had when President Trump visited London. The 20-foot-tall inflatable orange baby with the face of Donald Trump floated over Britain’s parliament as tens of thousands of protesters took the streets in response to the president’s visit. A failed petition to fly the blimp over Trump's golf course in Aberdeenshire, Scotland, prior to his visit, garnered more than 16,000 signatures. London’s Mayor Sadiq Khan defended his decision to let demonstrators display the blimp, citing the right to protest. "The idea that we would park our rights and privileges and freedoms because it may cause offense to a U.S. president, I think people in London and the U.K. would find objectionable as indeed would Americans," the mayor said on Friday. "We should cherish the fact they’ve got the right to [protest]." Girvan and Jimenez plan to do a nationwide tour with the blimp starting in August and are hoping to use the money they raised to create an American-made version, instead of transporting the original one from the U.K.
"Some of the plans we are keeping under wraps, but we are looking at Mar-a-Lago, there will be a Trump Baby flying off of his golf course, because he uses it as a hideaway from his job," Girvan said. "He doesn’t like doing his job, he doesn’t even know how to do his job." Girvan said activists from various states including California, Texas, Louisiana, North Carolina and Utah have already reached out to get involved in the tour. Girvan is part of the People’s Motorcade, a group of New Jersey residents and activists who've gathered at the Trump National Golf Club in Bedminster, N.J., every Saturday since May, creating a vehicle motorcade in protest. According to Girvan, the number of vehicles is sometimes in the 100s.